Yuval Dinary’s move-in day was a little different than most people’s. While the third-year Ryerson social work student was carrying boxes into his new home, near the intersection of Ossington and Dupont streets, he was being followed around by reporters from CBC Radio. He gave them an interview, and as he was organizing his bedroom, his movements were being recorded for background audio. “It’s so hard being so famous,” he jokes. 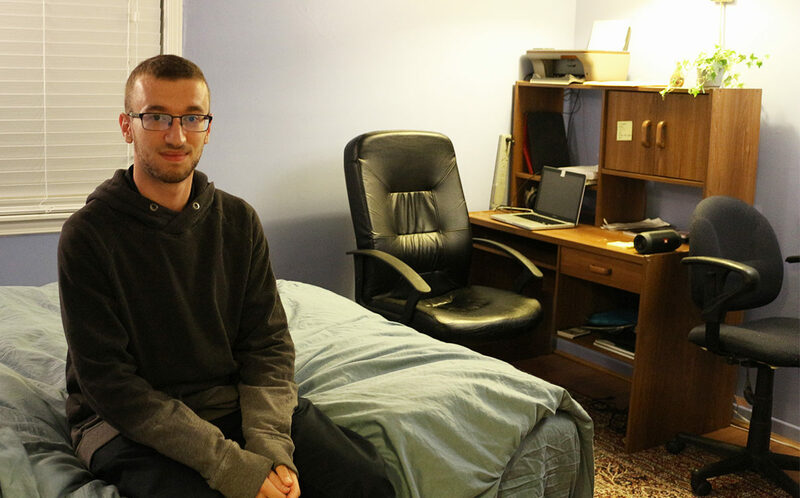 Although Dinary, 23, is not exactly a celebrity, he is part of Toronto HomeShare, an initiative that matches students looking for affordable housing with seniors who have extra space in their homes. The pilot project, which is run by the City of Toronto and the National Initiative for the Care of the Elderly (NICE), challenges issues related to age accessibility and Toronto’s affordable housing crisis. Raza Mirza is an instructor at the Ryerson Chang School for Continuing Education, as well as a senior research associate at the University of Toronto. He also serves as the network manager for NICE, and is one of many people that played a part in the creation of this project. He says they’ve had very positive feedback so far. The project focuses on building around all of the age-friendly principles that are outlined by the World Health Organization. One of the more important domains is housing, as it impacts everything that is part of the age-friendly domain. This includes the level of social participation a senior has in their community, as well as the person’s ability to “age in place,” meaning they are able to stay in the homes and communities that they prefer. “It’s an active response to try to build and sustain an accessible, equitable community and society for everybody,” says Mirza. The Canadian Centre for Economic Analysis found in a 2017 report that there are about five million empty bedrooms in Ontario, which is the equivalent of about 25 years of construction. “We wanted a way to leverage that to solve some of the housing issues,” says Mirza. However, the process to get into this program is a meticulous one, in an effort to decrease safety risks and ensure both home seekers and home providers are comfortable with the arrangement. All participants must first fill out an application, which is reviewed by a social worker. The application focuses on questions about the person’s lifestyle and preferences, determining how people feel about things like pets, smoking and alcohol. The applicants are also required to take a vulnerable sector screening, and go through a module that educates participants about issues like elder abuse, social isolation and intergenerational engagement. Once the social worker matches a student with an older adult, they hold a meeting where they are able to get to know each other and discuss logistics. The entire process is facilitated by a social worker, and once the student moves in with the senior, a social worker is always on call so that they can reach out in case any issues arise. According to the 2017 Toronto Seniors Strategy study, 70 per cent of Torontonians aged 80 or older reported some kind of disability or limitation that is expected to last six months or more, and this program requires students to contribute to the household that is hosting them. These contributions take up a maximum of five hours a week, and typically include doing things like taking the pet out for a walk, mowing the lawn or helping prepare meals. In other cases, students are expected to just spend time with the older adult, as a way of addressing issues of isolation and loneliness. This is particularly important, since the Seniors Strategy study says that one in five older adults in Toronto live alone, and this number is doubled if the individual is 85 or older. Dinary sits in his room on the very top floor of the semi-detached house, which is owned by his now-roommate, Kim Nyugen. The walls are bright blue, the room smells of freshly done laundry and, for a man in his 20s, his room is very clean. A clarinet stands in the corner and a copy of The Gulag Archipelago Volume I sits on his bookshelf. Dinary pays $600 a month for his “big-ish for Toronto” room, though some other HomeShare participants pay as little as $300. “I don’t think I would have been able to move out without (this program),” he says. Dinary first heard about HomeShare from his stepmother. Raised in Thornhill, Ont., he was living with his dad in the Yonge and Eglinton area at the time, and was eager to move out. Intrigued by the prospect of such cheap rent, he went to an information session and signed up. Though it took Dinary a few days to get used to his new home, he says this experience has been a positive one so far. He finds Nyugen very easy to get along with and he doesn’t mind helping her clean the house on the weekends, as well as some other chores she has him do. Dinary says their schedules are very off, and he does not see her very much. “She gets up very early, so in the morning she is usually downstairs on her computer. I come down to get my coffee and we always greet each other,” says Dinary. However, living under Nyugen’s roof means that he must abide by her rules, so when it comes to bringing friends over, he needs to let her know in advance. Since he is also doing a social work placement in a seniors’ home, Dinary says he is learning a lot about the issues impacting seniors. In both his personal and school life, he is surrounded by older adults, making him a much more understanding individual. Originally from Vietnam, Kim Nyugen has lived in her red-brick house since 1993. Walking around the home, it is clear that her family is one that is very loving and close, with photographs of her kids and grandchildren on the fridge, walls and just about everywhere else. 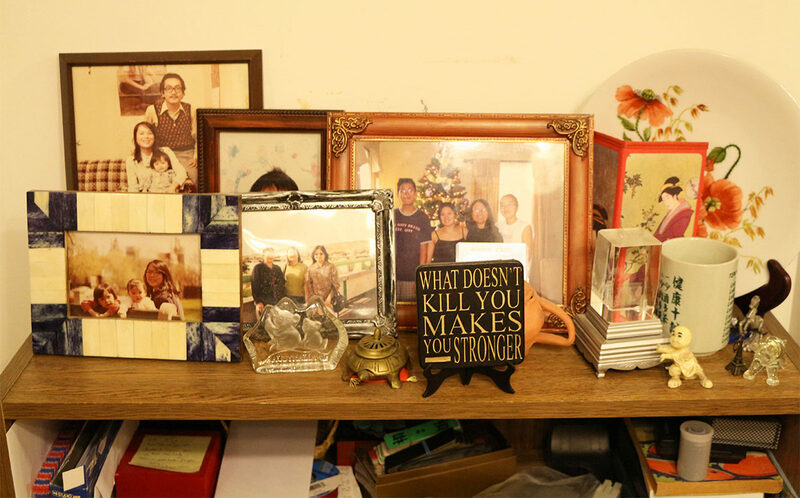 There is even an entire bookshelf filled with several dozen photo albums that are meticulously labelled and laminated, carefully documenting Nyugen’s entire life. As a widowed mother of three, all of her adult children have moved out and before Dinary moved in, she lived alone. Her house has several floors, with the top one having its own bedroom and bathroom. This is where Dinary currently lives, but before becoming involved with HomeShare, she had rented out the room for a few months to some students. Nyugen says she did not like living alone, as she felt having a three-bedroom home all to herself was a “waste of house space.” According to Mirza, 84 per cent of Toronto’s seniors are in a similar situation, as they are living above the poverty line, but considered to be over-housed. Though she is very independent and capable, something that worried her was that she did not have anyone around who could potentially call for help if something were to happen to her. Encouraged by her children, she decided to become a home provider in the HomeShare program. She was matched with Dinary, and the fact that he was a social work student was a big plus, since he would be more understanding when it came to living with someone with a mental illness. Due to the nature of the program, she feels like she can be more open with Dinary about issues that arise, which was not the case when she was renting out to other people. “If there’s something that he did that I don’t like, I talk to him right away because it solves the problem right away, so that small things don’t become big things later on,” says Nyugen. Nyugen currently works part time at Mount Sinai Hospital, and spends a lot of time volunteering and serving as a mental health advocate. She leads a very active social life, spending time with her friends and family. She finds it very beneficial having Dinary around, both for peace of mind and household help, as well as financial aid. Like Dinary, she plans to continue participating in the program, and thinks HomeShare is a great idea. “I hope I will be able to find somebody like Yuval, he is very quiet,” says Nyugen. As he gives a tour around the house, Dinary points out two rooms on the second floor, saying that these rooms are Nyugen’s and therefore, off limits. When asked if he ever snoops around when she isn’t home, he laughs, saying they have a mutual respect for privacy. Dinary says it is important for participants to remain very open-minded, as living with someone from an older generation is not always easy and comes with its own unique set of challenges. However, beyond the fact that this program provides a solution for the affordable housing crisis and making Toronto a more age-friendly city, HomeShare encourages meaningful intergenerational interactions that benefit both the student and the senior. According to Mirza, 12 per cent of seniors surveyed in the Toronto Seniors Strategy study said that they don’t believe they have a person in their life that they can call on for help if they need it. This is an upsetting statistic, especially since the population of seniors is expected to double in the next 20 years. It seems that programs like HomeShare will become increasingly popular, since they allow Toronto’s seniors to remain in their homes and be actively engaged in their communities, all while helping out struggling students in the process.